While the London React Meetup hosted by Red Badger right at Facebook HQ's, is full packed, you can still check its app from Joe Stanton. It unfortunately has no documentation but if you look closer at the configuration and it's code you can then figure out it's using an Amazon S3 bucket to (remotely) host its jsbundle. Yacine will create a small application that uses the microphone to do speech to text with a native module communicating to the React code (iOS). Recently released by Facebook, GraphQL isn't only useful for client-server communication. 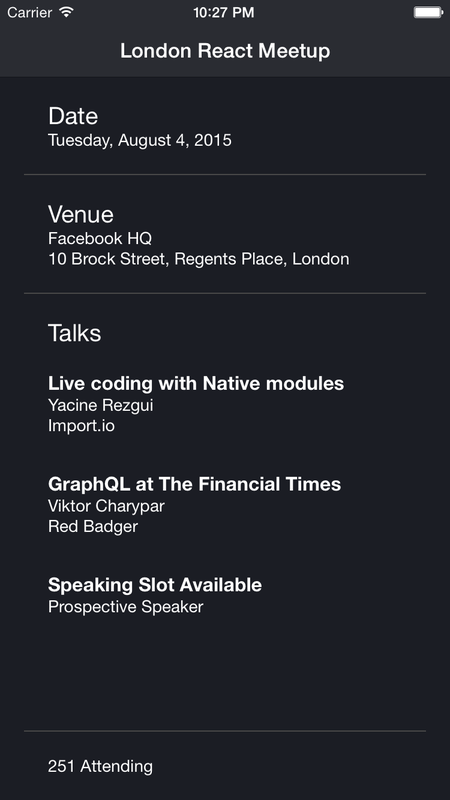 Viktor will show how Red Badger used the reference implementation - graphql-js - at the Financial Times as a generic data presentation layer over a set of backend APIs and how to deal with related requirements like caching or authorisation.